Place salmon a shallow pan and squeeze lemon juice over pieces. Make sure each piece is coated. 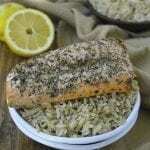 Place salmon pieces, skin side down on a parchment lined baking sheet or pan. Cover each piece with italian seasoning and sprinkle with salt and pepper.